From gin experiences to the best cocktails, there’s a gin bar for every occasion – here is a selection of the best in London. leaving others following in their wake. But what of its gin bar credentials? Unsurprisingly, these are top notch too. 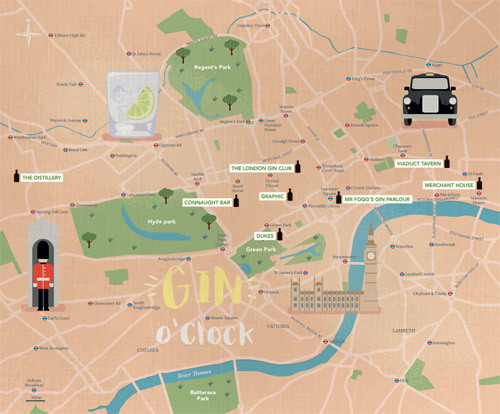 London’s links with gin run deep. Ever since soldiers brought Genever, a precursor to gin, back from Holland in the 16th century, the spirit’s place was secured in Londoner’s hearts. When Parliament passed the Distillers Act in 1690, declaring that anyone could make their own spirits, it resulted in one in four homes possessing distilling equipment. depravity that were apparently to be found on the city’s streets. Walk up the stairs out of bustling Covent Garden into a chintzy world of yesteryear, complete with oriental wallpaper, swagged curtains and twee oil paintings. As the name suggests, this is a bar ‘owned’ by fictitious globetrotter Phileas J Fogg, and as such the space is a carefully crafted, relaxing gin parlour that hints at Fogg’s exotic influences. The gin list (‘Encyclopedia Gintonica’) is impressive, drawing on products from around the world such as Ferdinand’s Dry Saar from Germany and Broken Hear from New Zealand. The cocktail list leans heavily but not exclusively on gin, with original creations like the light, refreshing Passepartout (Hendrick’s, lemon juice, sugar, black pepper and cucumber air), and a strong list of classics. liggers who love oysters should order the half-dozen for a reasonable £12. This cosy Soho bar is the place to come to learn everything you need to know about gin. Located in a wood-panelled room plastered with vintage tin adverts, they have a huge 370 gins, but they’re not for show. Ask about any and you’ll get told about the people who make it, where it’s made, and the botanicals used… but in a fun, informative way rather than as a geek-fest. Learning that I like Gin Mare, proprietor Julia Forte suggests Salcombe gin, another savoury gin that they serve in a G&T with a thyme and juniper berries garnish. It’s perfect. Those who sign up as members online for free are offered money off the myriad tasting menus available, and are kept up to date with new products and events. atmosphere where you’ll happily dawdle in one of the velvet armchairs for hours. meaning that no shaking or stirring is required. A few drops of vermouth here, a spritz of lemon zest over the top there, and voilà – your drink is served. With its marble and mirrors, the drama drips from every nook and cranny of the Connaught Bar. The star of the show is sharp-suited Agostino Perrone and his Martinis. Wheeling his decadent Martini trolley up to your table, he presents a number of tinctures for you to smell and choose from to add to your drink. If you want my advice, go for his suggested mix – a hefty dose of Tanqueray 10, the Connaught’s house blend of vermouth and his own Dr Ago’s bitters – then sit back and watch him pour the drink from a great height, flexing the lemon zest down the crystal-clear arc of water in the most balletic of gestures. Fabulous. delicious cocktails, before heading into a blending room to make their own. It’s £120 a ticket, and you’ll receive a bottle of your gin blend, plus a bottle of Portobello Road Gin. taste preferences before knocking up a bespoke Martini. What Graphic really specialises in, however, is bringing gin lovers together with their events. Their monthly Gin Socials sees a gin brand’s distiller or brand ambassador give a talk (tickets are £5, and include a G&T, gin tasting and a cocktail), while their regular Gin Off competition sees four brands battle it out, creating their own cocktail that the crowd gets to try and then vote on their favourite (tickets are £10, including four cocktails). We visited London in March when it was freaking cold. Good there were some nice places where we could enjoy Gin & Tonic. The best tine we had at the Distillery. Since then the Smoky Gin is my new favourite. Unfortunately not available in Switzerland at the moment.